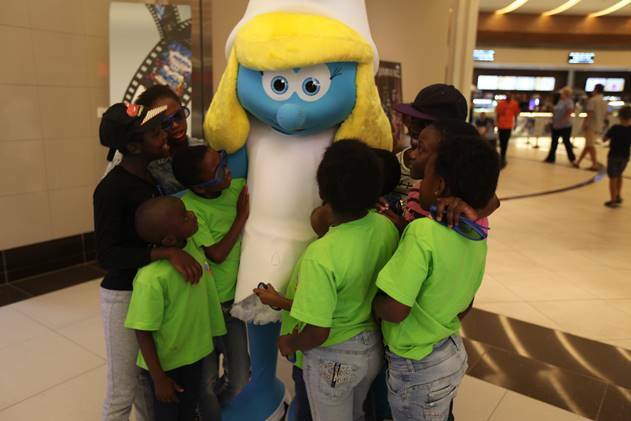 On Friday 31 March 2017, Silverstar hosted children from Reach for a Dream Foundation, for a magical day out at the movies to mark the release of Smurfs: The Lost Village. They were treated to a scrumptious lunch, a viewing of the movie, and the blue cherry on top – selfies and hugs with the beautiful yellow-haired Smurfette. The Smurfs Costume Tour made a stop at Silverstar, giving the children the opportunity of an exclusive meet and greet. The Reach for a Dream Foundation is a non-profit organisation that fulfils the dreams of children who have been diagnosed with a life-threatening illness. They believe in inspiring hope through the power of dreams and encourage children to use those dreams to fight their life-threatening illnesses. “We are honoured to have partnered with Reach for a Dream and play a part in making the children’s dreams come true. It was a great day out at Silverstar for the children and they had the best time meeting the live character from the movie. We look forward to fulfilling and inspiring more dreams at Silverstar”, says Sanele Ntombela, Marketing Manager at Silverstar Casino. The new Smurfs movie opened on 31 March 2017 at movies@Silverstar. Visit www.silverstarcasino.co.za for Smurfs: Lost Village show listings. Silverstar’ s Rewards Programme members can enjoy movie discounts of up to 80% (from 31 March 2017) and great restaurant offers at selected Silverstar outlets.